Thank you for the correspondence you have sent us, it's always good to read about Summerhill Road and the people living there. It brings back many happy memories. You asked about 28 Summerhill Road and the bombing, to the best of my knowledge it received no direct hits. Bombs falling nearby shook it up a bit. Incendiary bombs dropped in the garden. The bomb damage repairs after the war only amounted to the first floor bedroom windows front elevation being taken out. Then some windows replaced and the pointing around re-done. No damage to the stairs. You asked about our time as evacuees. In September 1939 we ( Victor aged ten, Edgar aged nine and John aged eight), complete with a brown paper parcel containing our clothes, a gas mask and a label with our name and address tied to a button hole, set off for Hoddesden in Hertfordshire. We went via Downhills School bus to Turnpike Lane underground station, to Liverpool Street station, steam train to Rye House station, bus to Hoddesden and then to a hall in Lord Street. On our arrival at Lord Street brother Edgar was not well and was taken to hospital. 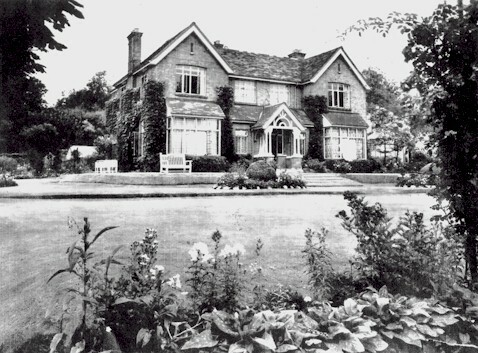 Brother John and I, together with another boy and his mother, went to Doctor West's house in Hoddesden. We were there for one week. We lived in the billiard room and we slept under the Billiard table. Mrs West told brother John and I that Edgar was now better and she was going to take all three of us to her friend a Mr Glasspool. Being three boys of a large family, we had to share most things we had, sometimes things not being to plentiful. We were about to start a very different way of life. I suppose you might say our introduction to Butter and Asparagus tips. On arrival at 'Howfield', we were met by Mary the housekeeper. Mrs West introduced us to Mary. We then unloaded Mrs West's car of our bits and pieces, she said goodbye and left. Mary showed us to our room, a large bedroom on the first floor, and helped us to unpack. The bedroom window in the front overlooked a Tennis lawn surrounded by gravel paths, which were lined with shrubs and flower borders, with a rose arbour which lead to the rose garden. Beyond was an orchard, which in the spring time was a mass of blossom. The side window in the bedroom looked towards London, and I recall seeing the sky over London one large red glow one night and hoping that my Mum was safe. About one year after our arrival Mary was taken ill and to keep things going Mr Glasspool employed a Czechoslovakian to help Mary. Her name was Franceska and she was of Jewish descent. She had escaped Hitler's persecution of the Jews but she had lost her husband and son who had been taken away by the Gestapo. She never heard from them again. 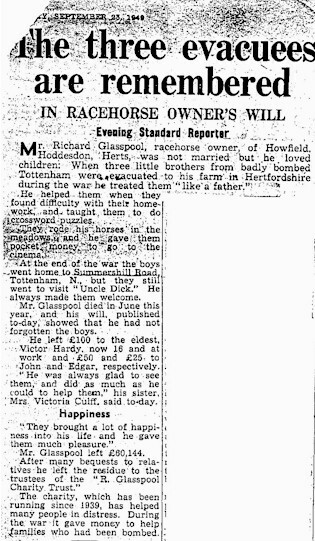 Our stay at 'Howfield' from September 1939 to late 1944, I look back on as one of the happiest times of my life, and I am sure Edgar and John would agree. We attended the local schools (Rye House School) and later Burford Street school. Mr Glasspool was a very firm but fair man and we were expected to do various jobs about the house and garden. The house was heated by coal and wood fires. Our jobs included keeping the coal scuttle and log baskets full and emptying the ash. One of my jobs was to change the flowers in various vases around the house. Bert Nunn would leave the flowers for me. Mary taught me how to lay the table for dinner each evening, which varied according to the menu. Mary and Franceska were both excellent cooks and if all our jobs had been done we would ask Franceska to cook us a Czech meal as a treat. Franceska's apple strudel was out of this world. With so much going on there was always plenty to do. We helped in the garden. Bert would show us what to do. We dug vegetable plots, sowed seed, planted and weeded. The vegetable garden was about one & half acres, with a further two acres of lawns and flower garden. We must have grown every flower and vegetable known at that time, including soft fruit, apples and pears. When working in the garden or on the farm, I was paid two pence per hour, Edgar and John one penny per hour. We helped Bill Gifford with his horses, cleaning out stables, feeding oats and bran in the winter, and boiling up Linseed and giving each horse a measure. We watched Bill and Bert bring foals into this world, getting a bridle into the mouth and a saddle on to their back. When the time came to take them to Newmarket to our trainer, a Mr Ted Leader, we would go with Bill in the horse-box, and see all the other horses at the stables. The hardest job at our stables was making manure, which involved forking the dung from the heap, spreading it over the ground, brother John spraying it with water adding a layer of clean straw, and so on until all the heap was used. After a period of time forking the heap over and re-stacking it at least one or two times, it finished up as compost and was then sent to Cheshunt to the nursery to grow mushrooms and this was all done by hand. As I was old enough I also worked on the nursery during school holidays where we grew tomatoes, cucumbers and salad stuff. I was paid for my labours and enjoyed every minute of it. SHOWING 'HOWFIELD' HODDESDEN The farm side of things was hay making for winter feed for the horses and the small number of beef cattle needed to keep the grass down during the summer. When the cattle were ready for market we (Bert, Bill, Victor, Edgar, John) drove the cattle along the road from Hoddesden to Hertford Market riding our bicycles. Real cowboys on bikes. The hay making was great fun all done with horse drawn implements. The Ministry of Food ordered that some land be ploughed up and Barley planted., the ploughing and sowing done by a land army young lady using a Fordson tractor, and a very good job she did. (according to Bert). All the work we did at that time was great fun and we enjoyed it. I am sure we must have done things wrong and been told off, but I don't remember it. Mr Glasspool was very much a Father to us. He helped us with our school work. He did crosswords with us on winter evenings and we played card games. He took us on long walks around Hoddesden and would tell us about places of interest. He asked us to go for a walk one day and, looking at the way we were dressed, said you had better change your clothes. We replied these are our best clothes. He said ask Mary to come and see me. 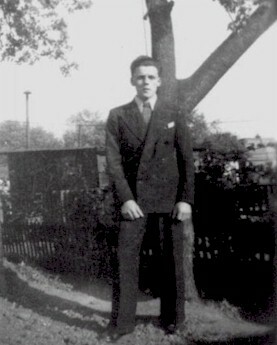 The next day we went to Hertford and he bought us new clothes, from underwear to top coats. We used every clothing coupon we had. He always bought us Christmas presents, and we had Christmas dinner with him and his friends and relations. We always bought him a small present from the three of us and he was very appreciative. His horse racing activities were very successful. He won the Ascot Gold cup among many other trophies. He would go to Ascot dressed in his grey morning dress and topper. If he had a good day he would come home, change his clothes and say "Come on boys ! We are going to do this or that", a treat of some sort for us. If he came home with a sad face it was best to keep quiet. This extract has been taken from the history of the Aga Khan's classic racehorses. Note that a horse owned by R.L Glasspool came second on this occasion. Winner trained by R. Dawson at Whatcombe. Starting Prices: 4 to 1 on Mumtaz Mahal, 100 to 7 each against the others. Won by ten lengths; half a length separated second and third. I could go on about 'Howfield' and say a lot more. But to sum up I would just say, Mary and Franceska two wonderful ladies. Bert Nunn our Groucho Marx bundle of fun. Bill was a kind and caring man. For Bill things had to be just right! Mr Glasspool took us into his house and looked after our every need and showed us a whole new way of life, something I will always be grateful for. He wrote to my mother during our stay with him and said how much he enjoyed having us there. We must have been the three luckiest evacuees of the war! I trust the foregoing is the sort of thing you wanted. A pungent humour, a teller of tales. No maestro at golf, but terribly keen. Yet hidden within was a heart of pure gold. Update August 2009: We have been working with Vic Hardy and conducted some fascinating research into the fate of Mr Glasspool's staff at Howfield in WW2. We have discovered that Francesca Leeb was to die in Hoddesden in 1966 aged 75 Years. The housekeeper Rose Payne was the informant of the death of Francesca and it was interesting to note that they shared the same address. Unfortunately Rose Payne was to die just one year later in 1967 at the County Hospital Hertford. We also discovered that the groom was actually born Henry (Rowland) Gifford in 1895 who also continued to live in Hertford and lived to the grand age of 91 years prior to his death at the County Hospital Hertford in 1986. We discovered that Bert Nunn was actually born Charles (Bertie)Nunn in Hoddesden in 1891. 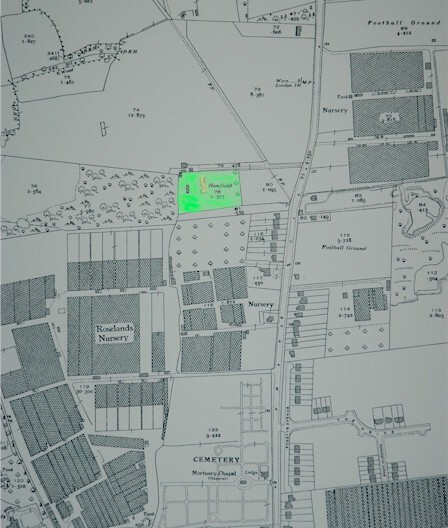 His family were all from the Hoddesden area and we can imagine he continued to live in this area until his death. Despite our best efforts we have been unable to determine when Bert Nunn died. It does illustrate however the close friendships that were formed by the staff when in the employ of Richard Glasspool. Clearly their friendship endured for many decades after his death.